Colorado Springs is a growing city that was originally developed as a vacation destination in 1871, as part of the 'health centre' boom of Colorado, being blessed with the nearby mineral waters of Manitou Springs, its high mountain ranges, and fresh mountain air. Today it is a popular tourist destination (tourism is the main source of income in Colorado Springs), attracting visitors to the magnificent scenery of Pikes Peak Country and the pleasant climate. It is a good base from which to explore the beauty of the surrounding area and most tourists come to marvel at the landscapes of Garden of the Gods and Pikes Peak, as well as to see the US Air Force Academy. Most of Colorado Springs' residents are retired or active military personnel and this lends a conservative mood to the city. Colorado Springs sits at the foot of its most famous landmark, the 14,115-foot (4,302m) Pikes Peak, and a breath-taking journey on the Pikes Peak Cog Railway takes passengers to the summit, from where incredible views over the Rocky Mountain Range, Denver and the endless Great Plains can be enjoyed. 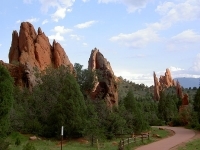 The marvellous red sandstone formations of the nearby Garden of the Gods have been sculpted into pinnacles and weirdly-eroded shapes by the wind and rain over millions of years, and the park has numerous walking trails that allow visitors to explore the landscapes away from the tourist-travelled roads. We are looking for contributors for our Colorado Springs travel guide. If you are a local, a regular traveller to Colorado Springs or a travel professional with time to contribute and answer occasional forum questions, please contact us.